Sorkin, who created US TV drama The West Wing and wrote the Tom Hanks movie Charlie Wilson's War, has even opened a Facebook account to aid his research. "I figured a good first step in my preparation would be finding out what Facebook is, so I've started this page," he wrote. He said the project was a joint venture between Sony and producer Scott Rudin. Sony has confirmed the as-yet-untitled project is in development. 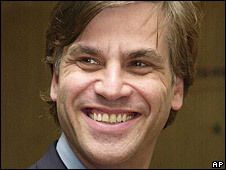 Sorkin added he was aware of other pages on Facebook from people who claimed to be him, but had decided it was "flattering more than creepy". "This is me," he insisted. "I don't know how I can prove that but feel free to test me." The 47-year-old admitted he did not really understand Facebook, or "how I'm going to write the movie", so was relying on fans to help him. "I honestly don't know how this works, which is why I'm here," Sorkin said. "If anyone has any questions, I'd be happy to answer them as best I can. If anyone has any comments, I'm glad to listen." Before signing off, Sorkin joked: "I feel about this introduction the way I felt about Sophie's Choice - It could have been funnier." 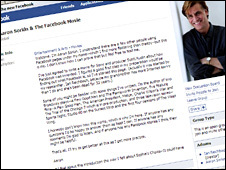 Since joining Facebook, the writer has been responding to questions and comments from fans, leading to some further revelations about the forthcoming film. "I have a fairly specific idea of what the first 15 pages of the screenplay will be and no idea what will happen on pages 16 thru 130," he wrote. "I have very strong feelings about the internet and its effect on our national culture, but frankly those feelings are being countered by the sophistication, kindness, curiosity and wit of the posts in this site. "You people are screwing me up with your civility and intelligence." Facebook was founded by Mark Zuckerberg in February 2004 while studying at US university Harvard. In the website's early days, membership was restricted to US students, but it now has more than 100 million users worldwide.